several months in which dominant symptoms are described as highly variable but with key symptoms of apprehension, motor tension and autonomic overactivity. Both classifications share exclusion criteria that involve determining that the focus of worry or apprehension is not a consequence of another disorder and is not related to organic causes such as hyperthyroidism or caffeine intoxication. • Do you think that you worry excessively? • When things are going well do you still find things to be worried and anxious about? • How long has this been a problem? • How much does worry interfere with your work, or social activities or family life? The main difficulty in establishing GAD as a primary or comorbid diagnosis is in distinguishing the worry and tension that are primary features of GAD from the worry and tension that frequently occur in adjustment disorders, anxious or avoidant personality disorders, other anxiety disorders, chronic medical disorder and, most commonly perhaps, depressive or dysthymic disorder. Structured interviews and questionnaires can be helpful in screening and assessing GAD and in monitoring progress during the course of treatment, and a useful review of relevant measures can be found in Antony, Orsillo & Roemer (2001). Generalised anxiety disorder is highly comorbid with other mental disorders (Kessler et al., 2001) and pure GAD is infrequently seen in clinical practice. Approximately 80 % of cases referred to mental health professionals comprise various combinations of GAD plus anxious personality disorders and other anxiety and depressive disorders (Maier et al., 2000; Wittchen et al., 1994). Comorbidity may be particularly high in clinical settings simply because it is the presence of other disorders that motivates GAD sufferers to seek help (Kessler, 2000). These complexities of clinical presentation are discussed at some length in Tyrer (1999) and may help to explain why GAD is often overlooked and undertreated (Ballenger et al., 2001). Critical reviews of the reliability, validity and clinical utility of GAD as a diagnostic entity can be found in Andrews (2000) and Rickels & Rynn (2001). In summary, GAD can be identified and diagnosed reliably provided that sufficient care is taken in asking the right questions and in establishing the presence of the disorder even when other disorders of a more obvious kind may also be present. It is important to bear in mind that GAD sufferers may lack insight into the problematic nature of their chronic tension and worrying and focus their attention instead on somatic symptoms or other disorders that are more easily recognised as pathological. 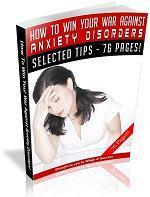 Tips And Tricks For Relieving Anxiety... Fast Everyone feels anxious sometimes. Whether work is getting to us or we're simply having hard time managing all that we have to do, we can feel overwhelmed and worried that we might not be able to manage it all. When these feelings hit, we don't have to suffer. By taking some simple steps, you can begin to create a calmer attitude, one that not only helps you feel better, but one that allows you the chance to make better decisions about what you need to do next.